Love leftovers? 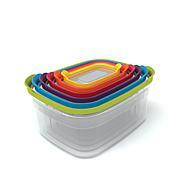 This set of storage containers helps keep them fresh. 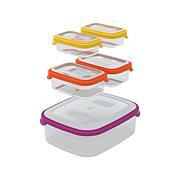 Color coding make it easy to match each lid with its container. Storage is easy, too. 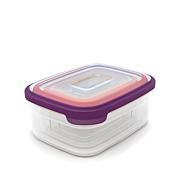 Containers nest one in another, and the lids snap together. Thanks Joseph Joseph for another innovative kitchen solution. 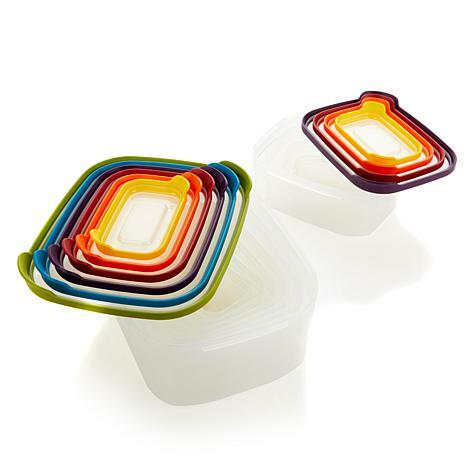 Before using in a microwave, remove lid. Use caution when removing container from microwave as it may become hot during heating. Avoid overfilling to lid level. Not suitable for use in ovens and grills. Weight: Total - Approx. 1.2 lbs. Love the quality of these, love the way they "nest" together and absolutely love the way they keep my product fresh. I would definitely purchase again. i love that the tops snap together and that the tops and bottoms are color coded. These really save space and you get a variety of sizes. 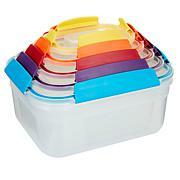 You will never have to search for a lid again or have the containers fall out of the cupboard. All the containers fit together easily. The lids snap together and fit right on top. It doesn't take up any more space than the largest container. Whoever invented these is going to be rich.